At 3, Cakes is really starting to delve head first into imaginative play. But that doesn’t mean it isn’t fun to have some props to set the scene and provide a more authentic feel to the fantasy being acted out. For the last few weeks she has been enjoying a very exciting addition to play time with the Step2 Creative Cooks Kitchen. 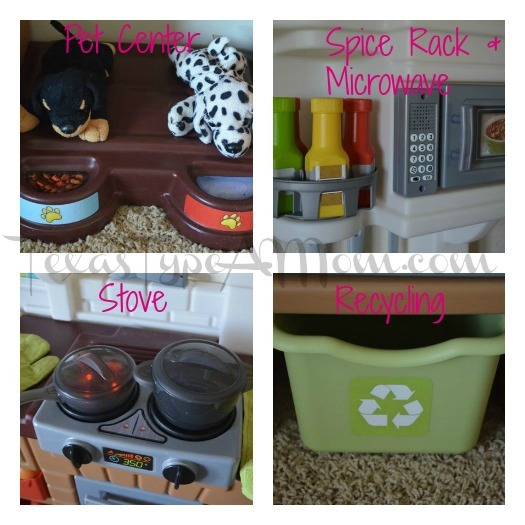 The Step2 Creative Cooks Kitchen is a new product for fall 2012 and is sold exclusively at Toys R Us. This bright and colorful play kitchen is perfect for encouraging kids to delve into creative, imaginative play that mimics real life situations. Everything your child needs to get started playing in their new play space is included in the box. There’s a lot of detail packed into this kitchen too! No detail was spared in making this a unique and realistic space for kids. From the electronic stove that lights up and makes noises to simulate boiling water and microwave to the spinning spice rack and coffee pot. You can not only interact by pretending to prepare food but can also reinforce other behaviors from your own kitchen such as feeding and watering the dogs using the pet center and placing things into the recycling bin. If you’re looking for a product that can grow with your child, encourages creative play, and is suitable for multiple children of either gender, then look no further than the Step2 Creative Cooks Kitchen. 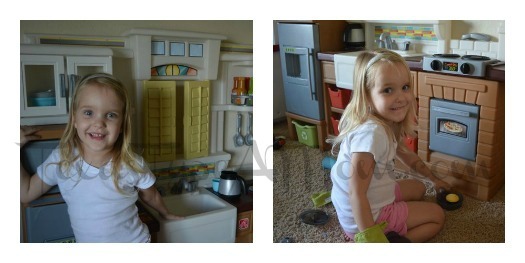 I can’t tell you how many countless hours Cakes has been spent playing with her new kitchen. It’s the first thing she shows guests when they come over and will use any excuse to play with her new toy just a few minutes longer. Win It: To help with your Christmas shopping, Step2 is graciously offering one lucky reader their own Creative Cooks Kitchen! The 50’s diner is cute! I like the LifeStyle™ Deluxe Kitchen–all of them are so cute! I like the Fresh Market Kitchen. I like the grand walk in. I like the grand walkin kitchen and grill. I like the MasterChef kitchen. I like the LifeStyle Grand Walk-In Kitchen. I like the cozy kitchen too but this one is my new favorite! Love! My son totally loves this (yes, my SON, this isn’t just for girls you know 😉 ) Thanks for the great giveaway, and your daughter is a doll! I like the Grand Walk-In Kitchen and Table Set! Thanks for the great giveaway and happy holidays! The 50’s diner is so cute! I like the Fresh Market Bistro Set! omg what a cool gift my nieces would love the pet center!! The Grand Walk-In Kitchen & Grill is so cute! Love the retro look of the 50’s Diner! Love the 50’s style diner kitchen! With 3 little girls under the age of 4, I can’t wait to get this kitchen for them. Such a hot ticket item right now, Toys-R-Us locations on the west coast are sold out right now. This kitchen has everything they could want-how fun! I love the Lifestyle Legacy Kitchen. Grand Walk-In Kitchen & Grill™ is amazing! I like the Prepare & Share Kitchen. I like the welcome home kitchen. 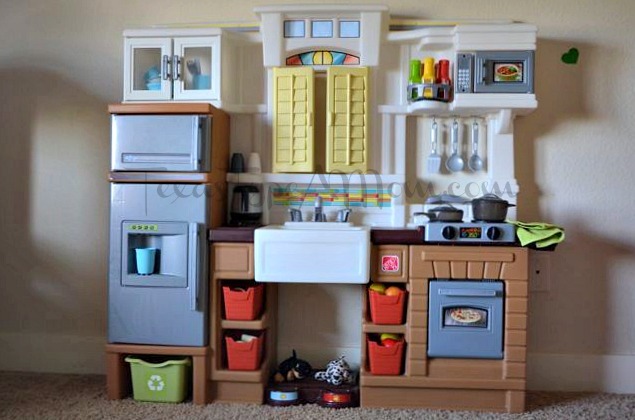 I love the Deluxe Kitchen Play Set. The Grand Walk-In Kitchen & Grill. My favorite is the Grand Walk-in Kitchen & Grill. i like the master chef kitchen and the 50s diner. Love the Gourmet Cafe Kitchen! I like the New Traditions kitchen. I love the Grand Walk-In Kitchen and Table Set although I have no idea where I would put a kitchen that big! I like the Fresh Market Bistro Set. the Grand Walk-In Kitchen & Grill! I like the 50’s Diner….so cute!